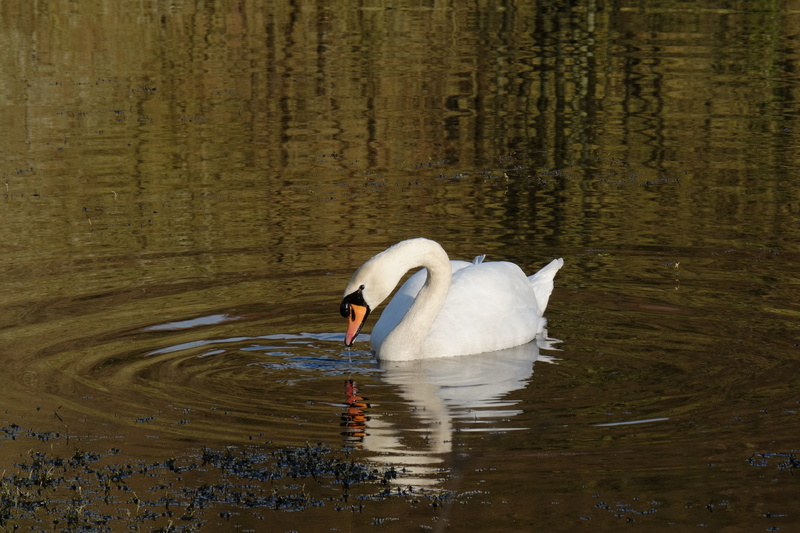 At least one of the main characters in each of my novels is obsessed by swans – our resident, native Mute Swans rather than anything more exotic. Their obsession mirrors my own. One of my earliest memories – I must have been three or four at the time – is seeing a swan fly into power lines and break its neck, while I was out walking with my mother close to Glasgow’s River Kelvin (in those days, the river was so polluted you could smell it from quite a distance away). A passer-by who clearly knew how to handle swans retrieved the bird from the roadway where it had fallen, but there was nothing he could do for it. I’ve never f orgotten the incident, and it’s left me with a passion for these serene, graceful birds. Close to where we live now there’s a disused millpond; it’s badly silted up, but it’s regularly visited turn about by a pair of adult Mute Swans (they built a nest last year, but didn’t breed) and another pair which seems to breed very prolifically (seven cygnets in 2013, four last year), but which only brings the family to the mill-pond once the cygnets are well-grown. The sad news is that, in the last few days a single adult swan has turned up. There’s no way of knowing if it’s from one of the usual pairs, because as far as I’ve seen, none of them is ringed. Although it’s a myth that swans mate for life and never split up (see this excellent website: http://www.northwestswanstudy.org.uk ), I can’t help feeling anxious as to why this one’s on his/her own. According to the RSPB website, flying into power lines is still one of the most common causes of premature death in Mute Swans, now that lead poisoning courtesy of anglers has declined drastically. The British Trust for Ornithology has some fascinating statistics about these birds: the oldest recorded swan reached the age of 28, although a more typical life-span is ten years. There are over 6,000 pairs in the UK, and their numbers have been increasing since the use of lead fishing weights was banned. (See http://blx1.bto.org/birdfacts/results/bob1520.htm#demography). 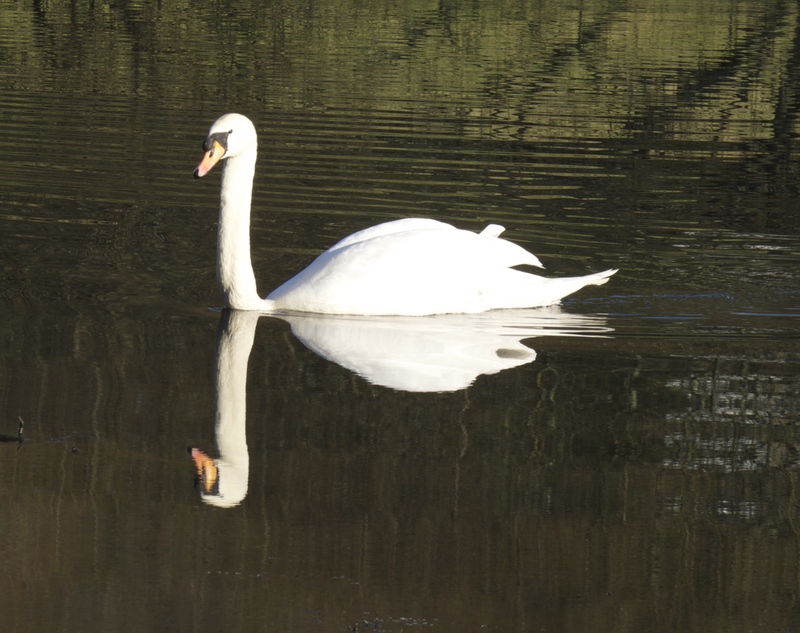 For an interesting – if somewhat depressing – study of swans in a typical built-up area, read this: http://www.berksbirds.co.uk/articles/muteswanmortality.asp. I just hope that our resident single swan finds a pal quickly – he/she (it’s difficult to tell the sexes apart, specially when there’s only one – the male is a little larger) has a handful of mallard ducks for company, but I’m sure it’s not the same.